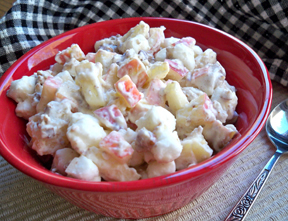 A delicious salad that has just the right mix between a sweet and salty taste. The crushed pretzels provide for a crunchy texture and the pineapple provides great flavor. 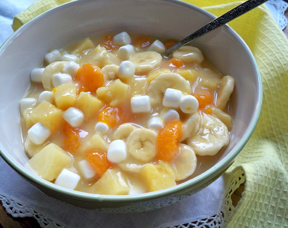 This sweet salad is often mistaken for a dessert. 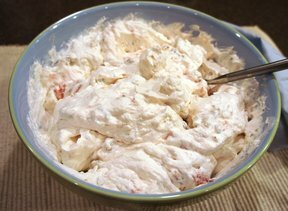 Combine the cream cheese and sugar together in a mixing bowl and beat until the sugar is well mixed into the cream cheese. Add the whipped topping and pineapple. Beat just until they are mixed in evenly. Store in the refrigerator. Combine the crushed pretzels, melted butter, and sugar. Stir together until thoroughly mixed.. Spread the pretzel mixture out on a small cookie sheet that has sides. Place in an oven preheated to 425 degrees F. and bake for 5 minutes. Remove and allow pretzels to cool. 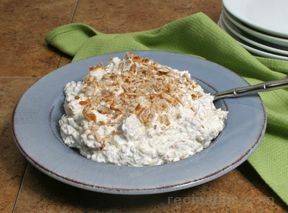 Add the crushed pretzel mixture to the cream cheese mixture just before serving. Note: Mix up only the amount that you feel will be eaten because the pretzels will become soggy after a few hours of being mixed in the cream cheese mixture. "Everyone loved this. It's the perfect mix of sweet and salty! I had my pineapple draining while I was preparing the pretzel mixture to get as much moisture out as I could. Didn't have to worry about sogginess because there wasn't any leftovers." "Had this at an Anniversary party last week...It was sooooo Awesome!" "I have had this recipe for over 20 years. I would like to add a few tips which don't seem to be in this particular recipe. First: Prepare the pretzels first. My recipe calls for 400 degrees for 7 minutes. Also 1/3 cup suger to 1 stick, room temperature butter. Mix sugar and butter together then add pretzels. Pretzels should be carmelized to give it the yummy crunch, a good cookie sheet is your best friend here. It would be very hard to add the pretzels after the dish has set and if they are done right, they won't be too soggy. I always save a handful to add to the top of the dish. Make sure you drain your pinapple very good, (saving juice for a coctail). I love this dish and it's a fan favorite of mine, anytime of the year. Enjoy. I hope you found this helpful." "Delicious! The sweet pineapple with the salty pretzels is perfect."